Once Joann suggested something heavy, I didn’t look back. Recipe in hand, I dragged her to a local butcher, confessed my ignorance to the staff, and said I was looking for short ribs and oxtail. A quick conversation followed, something about flanken cuts, then what looked like a huge piece of meat was carried to a nearby bandsaw, cut, and wrapped in white butcher paper. Oxtail came next. I guess it never occurred to me that oxtail was a literal name for something, but I immediately understood once I saw an 18 inch long intact cow tail go onto the counter scale. Oxtail…now I know. Further research revealed that oxtail, when simmered for hours, was especially good at releasing gelatin into broths to thicken soups. Seems a likely reason for its inclusion here considering how little meat came from it compared to the short ribs. Step 1 of the recipe called for all of the meat to be simmered for hours after a quick sear in a hot pan. 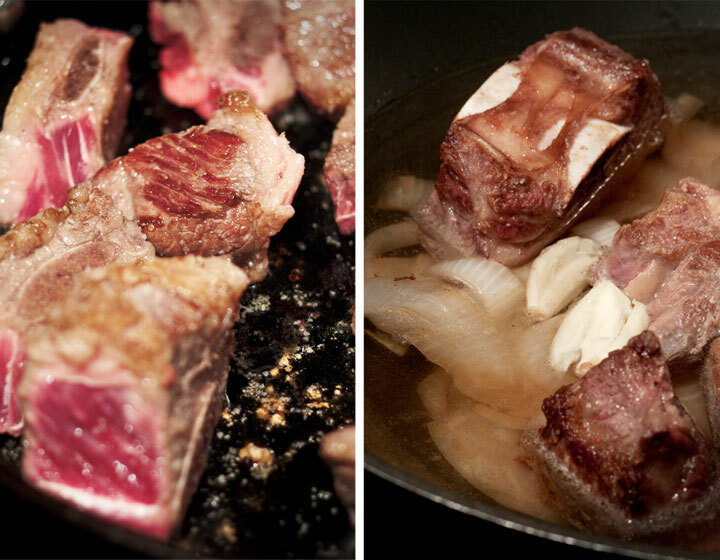 Short ribs, oxtail, and a sliced white onion joined several cups of water in a large pan for about 5 hours. At the end of that time, it was allowed to cool. I lifted out some of the onions and refrigerated the broth so it its fat would separate by morning. 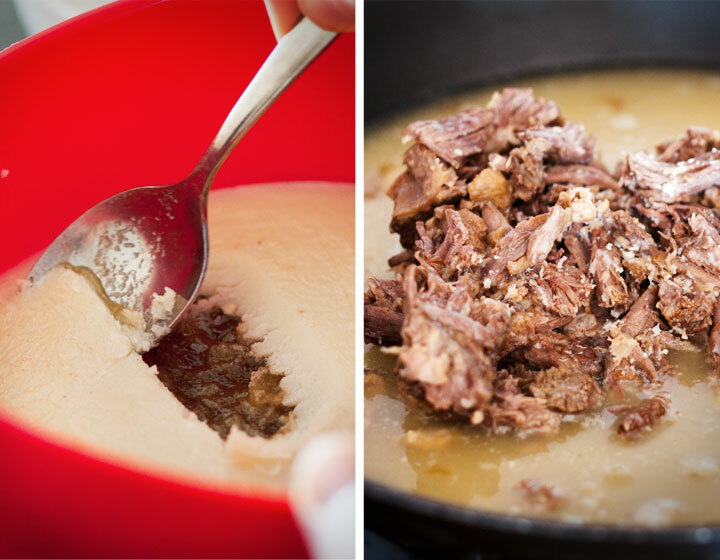 The meat was also removed from the broth and shredded by hand before a night’s rest in the fridge. The next morning was veggie time. Zucchini, fingerling potatoes, cilantro, arugula, guajillo chiles, ancho chiles, and a couple of limes were all appropriately cleaned, cut, and prepped to join the meatfest in time for lunch. Preparing the chiles was especially fun as neither Joann nor I had done anything quite like it before. 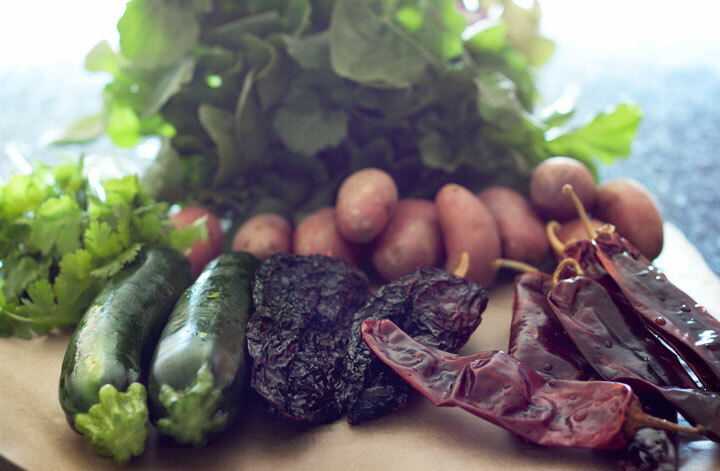 Both types of required chiles were sold dried and the recipe called for them to be toasted in a hot dry pan. 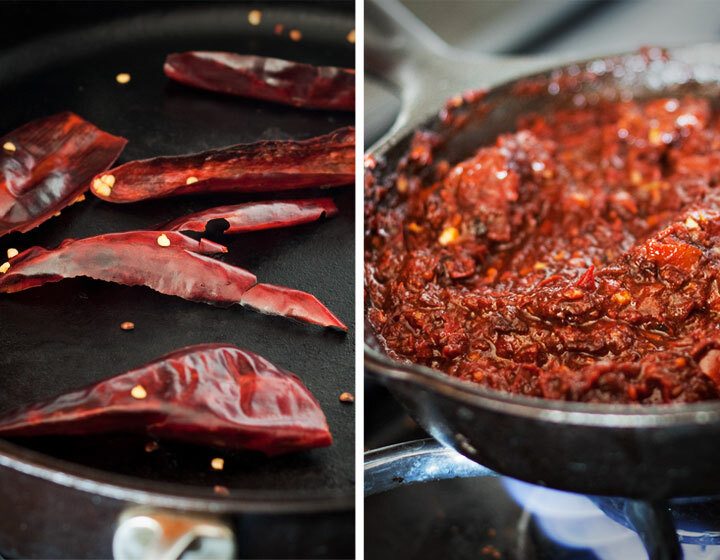 Our arm-breakingly heavy cast iron Lodge skillet came in handy here and provided a great visual background to the reds and dark scorch marks of the chiles. Pretty stuff. After toasting, the peppers were soaked in water to rehydrate, then joined a couple of other ingredients in the food processor to yield a paste. This then went into a smaller pan to be cooked and reduced slightly. The next morning, the broth that had been refrigerated the night before had separated as planned, making the fat easy to skim off the top. 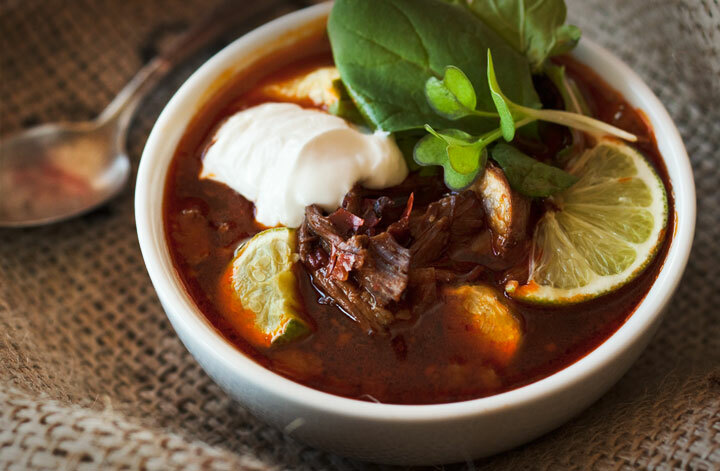 It was very clear at this point that the long simmer the night before had done its job and the broth itself was thick and gelatinous, exactly as refrigerated leftovers of Xoco’s soup appear before reheating. I was on the right track. The broth and shredded meat were placed in our largest pan along with several cups of chicken broth and brought up to a simmer. While the meat and broth were heating, the potatoes and zucchini that had been washed and cut earlier went into the oven for roasting. The chile paste was added to the quickly heating broth and meat mixture, immediately creating the soup’s trademark red color. Once the veggies were done roasting, they were added to everything else and the nearly complete soup was simmered for about a half hour. I have to confess some surprise at how complex this recipe was, but looking back I think I understand why nearly every step was necessary. Much respect to those who understand details like these well enough to recommend them in the first place. While the final product wasn’t Xoco quality, it tasted fantastic. One thing that I’ve always enjoyed about this soup is how the arugula’s strong flavor balances the meaty and peppery flavors of the soup perfectly. 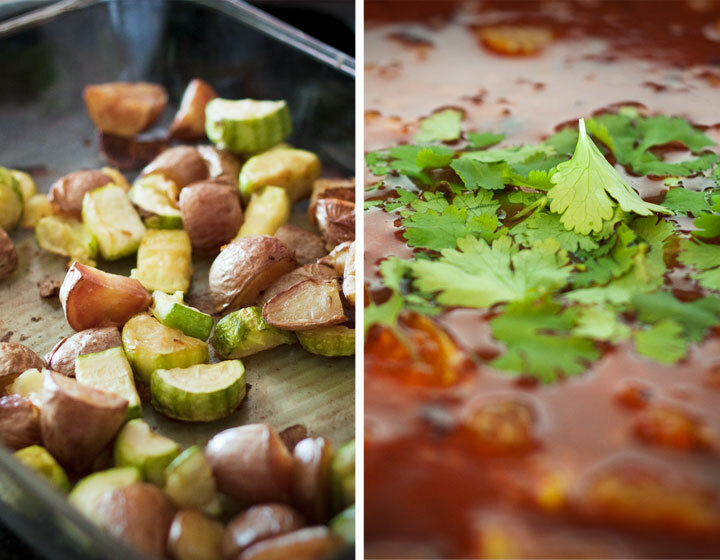 A squeeze of lime also adds a bit of lightness to what is really a hearty dish and the veggies provide a much welcome texture variation from everything else. Really fantastic to eat and a pride-inducing dish to make. The full recipe can be found at Rick Bayless’s site, which also has a number of other interesting recipes to try. 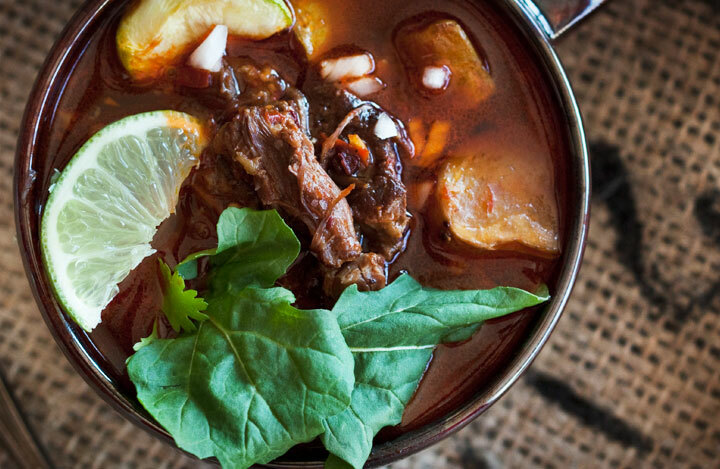 § 4 Responses to Not So Vegetarian – Short Rib Caldo"
I could almost taste all of the individual ingredients in the soup just by your pictures and description on how everything was suppose to come together. Soups are one of my favorites, I do have many, but that is one dish I could eat any time of the year. The first time I saw Rick Bayless he was on t.v. making a Mexican Hot Chocolate. We saw Rick Bayless in one of his restaurnats, XOCO. He seemed really down to earth and was just helping his staff like a regular guy. I wasn’t a huge fan of Mexican food until I tried his food. There is always a twist to it. Thanks to the comment on my blog. I’m glad you like it. I can’t believe the patience you have when preparing your dishes — that’s probably why they’re so good! Dustin has more patience than I do. I think that is why he does so well with baking. The recipes will need to get lighter and easier as the summer weather approaches.